Casey Kasem (born Kemal Amin Kasem; April 27, 1932– June 15, 2014) was an American radio personality, stand-up comedian, actor, voice artist, and comedian. He is known for his many voice roles in cartoons and for being a public radio personality. Kasem was born Kemal Amin Kasem in Detroit, Michigan, on April 27, 1932, to Lebanese immigrant parents. They settled in Michigan, where they worked as grocers. Kasem graduated from Northwestern High School in Detroit and Wayne State University. Kasem's career began in the radio business in the 1950s in Flint, Michigan. He then made his first movie appearance in Easy Rider in 1967. He was the host of the weekly American Top 40 radio show from 1970 to 1988, and again from March 1998 until January 10, 2004. Ryan Seacrest is now the host. Kasem is the host of two weekly radio shows, American Top 20 with Casey Kasem and American Top 10 with Casey Kasem. Kasem did the voice of many advertisements, has done many voices for Sesame Street, and is the voice of 'Shaggy' for the animated television show Scooby-Doo. Kasem retired in 2009 because of old age and health concerns. Kasem married Linda Myers in 1972. The couple had three children. Kasem then married Jean Thompson in 1980. The couple had one child. Kasem lived in Washington state. Kasem was a Democrat. He narrated television ads for 1972 president candidate George McGovern's campaign. On May 12, 2014, Kasem was declared missing by a Los Angeles court judge ordered an investigation for his whereabouts. Soon after, Kasem was found alive in Washington state. 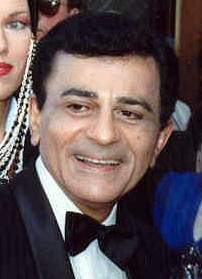 Kasem suffered from Parkinson's disease and an early form of dementia. On June 6, 2014, Kasem was in critical but stable condition at a hospital in Washington state hospital, receiving antibiotic treatment from blood pressure and bedsores. He also suffered from Lewy body disease, the most common type of progressive dementia after Alzheimer's and was bed-ridden. Kasem died in Gig Harbor, Washington from complications of dementia and sepsis, aged 82. On August 14 it was reported in the Norwegian newspaper Verdens Gang that Kasem was going to be buried in Oslo. The funeral administration of Oslo, Norway confirmed that Kasem was buried at Vestre Gravlund in Oslo on December 16, 2014. ↑ "Casey Kasem's birthday". Comcast.net. Retrieved June 5, 2014. ↑ 2.0 2.1 2.2 2.3 2.4 2.5 "Casey Kasem Biography (1932-)". FilmReference.com. Retrieved May 10, 2011. Source notes: "some sources cite 1933"
↑ "Person of the Week: Casey Kasem". ABC News. January 2, 2004. Archived from the original on October 12, 2004. Retrieved January 1, 2012. ↑ "George McGovern '72 & '84 Television Ads". YouTube. YouTube. ↑ "Judge Orders Probe Into Casey Kasem's Whereabouts". ABC News. Associated Press. May 12, 2014. Retrieved 2014-05-12. ↑ "Casey Kasem whereabouts". May 15, 2014. ↑ "Casey Kasem's daughter asks judge to let her move terminally-ill father to a Los Angeles nursing home amid claims he has only six months to live". Daily Mail.co.uk. Retrieved June 5, 2014. ↑ "Casey Kasem alert but in critical condition". CNN. June 6, 2014. ↑ "Casey Kasem, Wholesome Voice of Pop Radio, Dies at 82". New York Times.com. Retrieved June 15, 2014. ↑ Tim Appelo (August 14, 2014). "Casey Kasem to Be Buried in Norway". The Hollywood Reporter. Retrieved August 15, 2014. ↑ "Casey Kasem -- Buried in Norway ... Finally". TMZ.com. December 22, 2014. Retrieved December 23, 2014. ↑ Gulbrandsen, Elise Alexandra; Huseby, Marcus; Alvsing, Felicia. "Amerikansk radiokjendis gravlagt i Oslo" (in Norwegian). Verdens Gang. Retrieved 22 December 2014. This page was last changed on 27 June 2018, at 23:55.